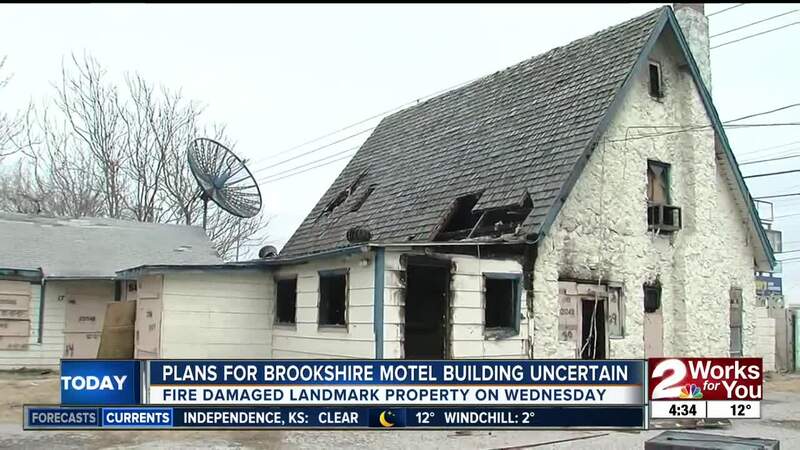 TULSA -- A Route 66 landmark destroyed in a fire leaves many wondering what's next for the Brookshire Motel. "It was a very popular and successful roadside motor court on Route 66," said Amanda DeCort, Executive Director of Tulsa Foundation for Architecture. The Brookshire Motel was a hot spot in the 1950s. In sun or snow, the iconic neon sign drew in crowds traveling along the Mother Road. "A very cool building, it has a lot of history, the neon sign is fabulous," said DeCort. The motel sat vacant for years. The Tulsa Route 66 Commission and Tulsa Foundation for Architecture had their eyes on the property to restore it. "The Brookshire was a beacon for us, something we wanted to do what we could to save," said Rhys Martin, Chair of Tulsa Route 66 Commission. But the revitalization plans were put on hold because of issues with the owner of the property. "Whenever a piece of property has ownership dispute, there was really nothing we could until that was settled in the court system," said DeCort. The Brookshire Motel went up in flames on Wednesday, destroying a majority of the building. Now there's a question of what's going to happen to the motel. "To see it just, dripping and destroyed by fire, was really frustrating and really sad," said DeCort. Now their vision for the motel may never become a reality. "People would come in, get an actual key to their room inside of a card, and then a courtyard where other people who are staying there can get together and visit and learn about each other," said Martin. The Tulsa fire department is looking into what caused the blaze, and the city's code enforcement team is working to get the structure secured, and speak with the owner on the motel's future. "There’s a lot that could have been done with the property and I don’t know what will happen now," said DeCort. According to city officials, the property was declared a nuisance on April 19, 2017. City leaders said the owner did not take steps to address violations and the city incurred more than $10,000 in abatement charges for the property.